As if on cue, the all-day downpour ended just in time for our standout to commemorate World Water Day began. “Leave no one behind” is the United Nations title for this year’s week- long series of events to bring attention to water issues and injustices in the world. 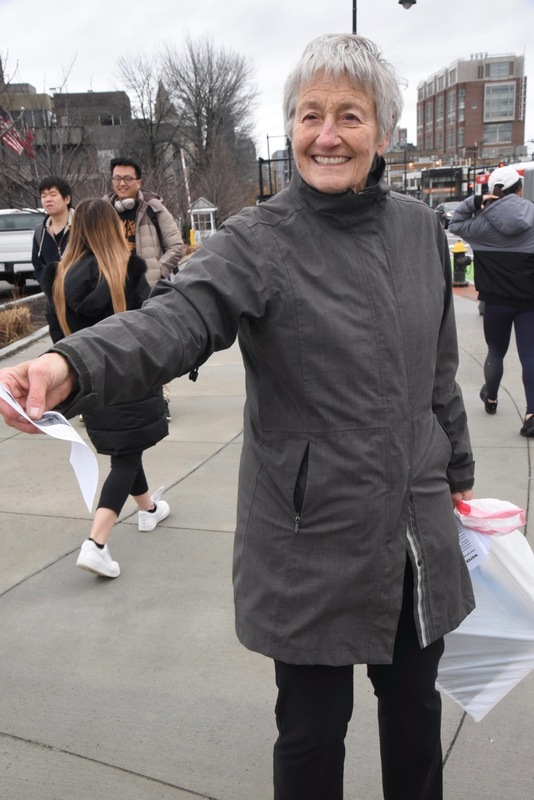 Fifty of us from several different organizations, students and individuals dedicated to pursuing the freedom and equality of Palestinians, gathered at the Boston University Bridge. We flanked all four corners of the bridge. Our signs and banners received many nods and waves of appreciation and acknowledgement of the righteousness of our cause. Of course, not everyone agreed with us, but those who didn’t were surprisingly and happily few in number. We gave out hundreds of fliers to people passing by and those in cars stopped at red lights. Our mission is to explain what is happening on the ground regarding Israel’s theft of (with the help of U.S. taxpayer dollars) Palestinian water in the West Bank and Gaza. We believe it is our responsibility to let our neighbors and the world know that the situation is dire! While Jewish Israeli settlers are swimming in their pools, Palestinians are thirsty! The Gaza Strip will be unfit for human habitation, next year according to the United Nations. Today in Gaza, 98% of the water is unfit to drink. In the West Bank, Israel’s water policies are forcing farmers off their land. Palestinians are indeed being “left behind” and we are determined to put an end to this water injustice.